Propsummit.com a Blade Runner Prop Community Forum BladeRunnerProps.comView topic - H.R. Giger- The Biomechanoid foundation of Alien..
H.R. Giger- The Biomechanoid foundation of Alien..
Posted: Sun May 10, 2009 1:13 am Post subject: H.R. Giger- The Biomechanoid foundation of Alien..
A journey through Giger's Alien, sets, and visions of an alternate reality. Here is an interesting site I stumbled upon, a Giger DVD that apparently has only been formatted for Central Europe, or only available in Czech Republic..
Giger's ALIEN tells the story of his involvement in the film from his persepective. It contains many stills taken on the set and in Giger's workshop. The creature is also influenced by another painting in the book, Necronom V. The Space Jockey was influenced by that other figure at the top there. Necronomicon has been reprinted numerous times, and is available in hardcover and paperback from "Morpheus". 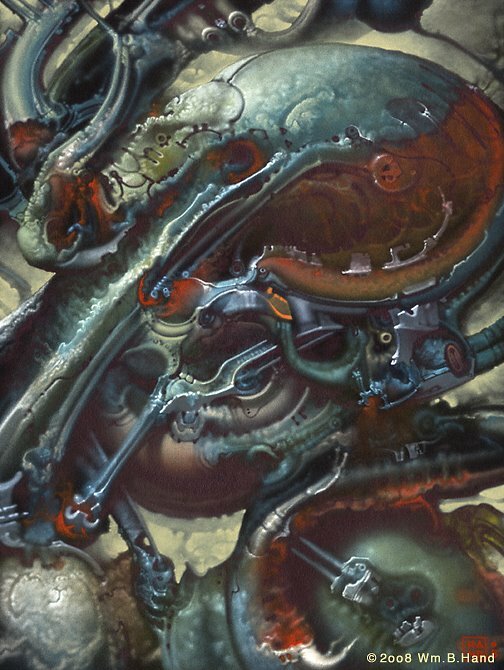 Personally I'm not that captivated by the DVD images... it looks like scans of Giger's paintings have been cut up, mapped onto simple 3D objects. "morphed", and had various things 'done" to them. The effect is like watching paper dolls f*cking. he probably is not a total "psychotic", but he definitely has no troubles in dealing with inner dark psyche. I got an email from a friend who was telling me he saw him and his wife (girlfriend?) and they were way out there, him in all black and she was wearing black leather and a big upside down cross necklace. One can tell he does have good eye for beauty, she has a face similar to his old paintings from 20 or 30 years ago. Well Giger was Goth before Goth was fashionable. The all black clothing is just classic Art garb... you get a lot of the all black look in New York as well. It's just a style. The inverted crucifixes and Baphomet images (the goat god guy), and the explicit profane sexuality... it was all supposed to be provocative. I don't think Giger was into science fiction at all, he was just into the art and being provocative and making his statement about decay and disease and the biological mixing with the mechanical. His work seems very dream-inspired, and even obsession-inspired, if you read his notes in "Necroomicon" and "Species Design", which is the book of his work he did for that film. 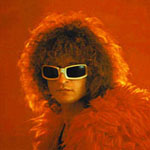 When I was younger, Goth was the Bauhaus, Love and Rockets, and on the punk side the DAMNED or T.S.O.L. Who would ever imagine he would start an actual trend in that stuff. I think a line of H.R. Giger clothing with the Giger style would sell like crazy. I am kinda thinking this is right, I remember I had a chance in the mid 90's to buy a Giger skateboard and like a dork I passed it up. Probably would be worth some $$$ now .. I was goth before Goth was fashionable. I seem to pretty much grown out of it though...pretty much. I love Giger's work too, and I have quite a few of his books. I agree too that his diseased baby pictures are not for me. I tend to mostly like his pure bio-mechanical stuff the best. I seem to remember him making his own Science Fiction film too. All I remember about it was he had a dog in a suit in it before it was done in Alien 3. He is probably like any true artist exploring his subconscious to it furthest reaches, and trying to conquer his own fears by engulfing himself in them. 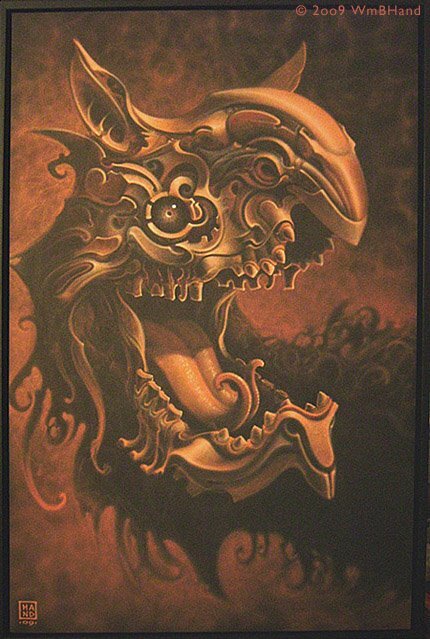 I have a friend who's work is(was) similar and almost on par with Giger. He also has been in contact with Giger himself. I have been trying to get him to join this board for a while now. I will try and post some pics of his work here sometime. 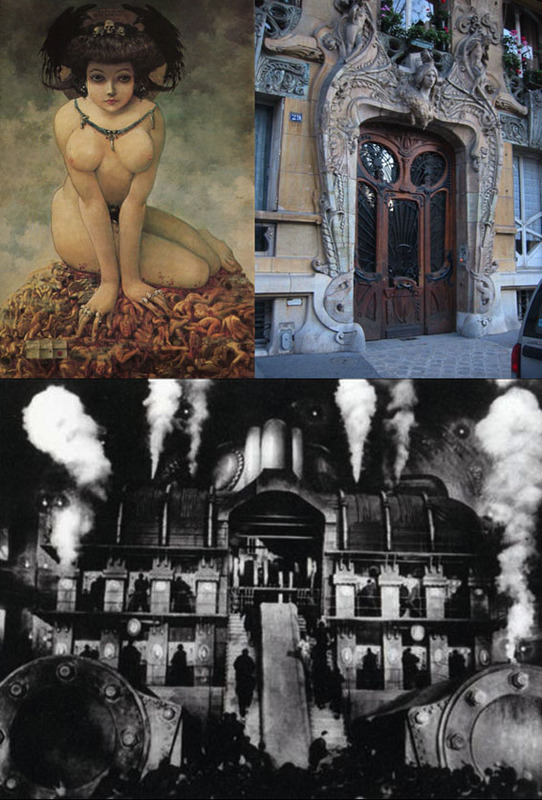 I also post those particular examples because I truly think Giger was influenced by painters, architects... and moviemakers, making him a true genius of our times (Just look at his oeuvre, he's worked in all those fields). I think the master of "way-out-there" is Jerome Bosch, the flemish painter...don't have images but I'm sure Fred knows what I'm talking about. 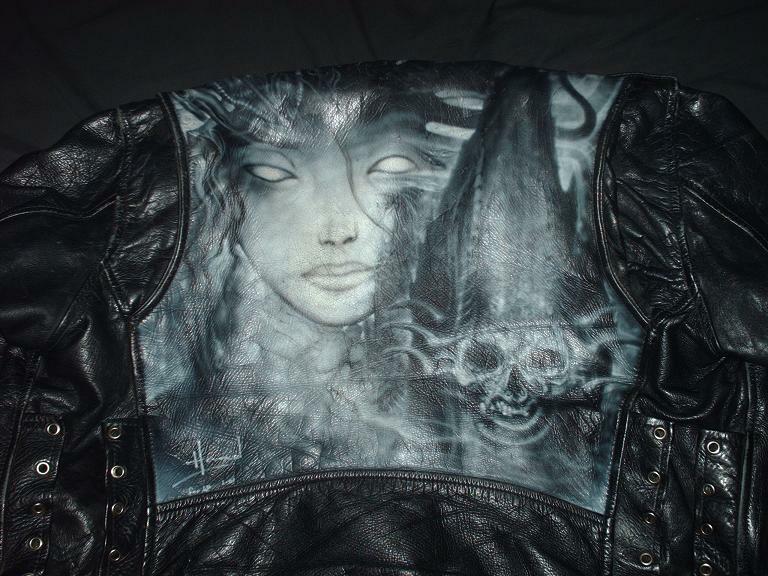 Here is the back of my leather jacket that I wear almost everyday, painted by Bill Hand in 2001. His work is actually a lot better than this when he has a better canvas too, and it is more original now as well. Dude, that is seriously f'kn cool. We all have a bit of Goth in us, but we don't all explore it. Of course most of the "goths" I know now aren't all that goth in anything more than fashion. This is the painting I own from him. Some very seriously good paintings there. Giger's a strong influence for me when I do my photo montage stuff, the rest of the time I'm bowing down at the altar of Ridley Scott & Syd Mead. SHAME ON ME !!! You're right Joberg, I should have included Jerôme Bosch, it's so obvious Giger took inspiration in the masterpieces of this XVth century master !!! I always thought his first name was Hieronymus? I always loved his work too. I guess that makes me a sick puppy. "Jerôme" is the french translation for the flemish "Hieronymus" (= Jeronymus = Jerôme). In Belgium you have both langages, flemish & french, so both are correct.